Going to the local gun range is good but very limited. Everyone should indeed visit their local gun shooting range periodically to maintain their skills and familiarity with their tools. You don’t want to grab your gun in an emergency and have to spend time trying to remember how to make it go bang. 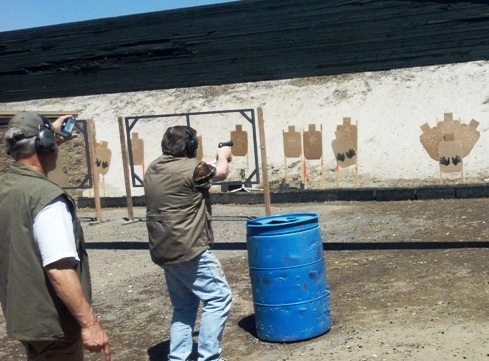 But as I said, a simple gun range is limited in that you may not use a holster at most ranges, you can’t move from your lane position with a loaded weapon, and it’s all very calm and relaxed while you fire at a static paper target with maximum accuracy. As such, range shooting does not come anywhere close to a real life situation where you might have to defend your life or your family. Enter IDPA which stands for International Defensive Pistol Association. It was founded in the mid 90s to provide more realistic scenarios for competition and training. 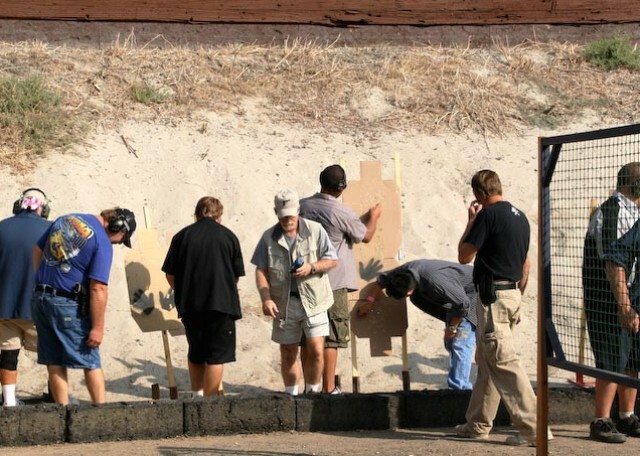 It simulates self defense scenarios and real life encounters to give participants active concealed cover training that goes beyond simply standing at a range bench and killing paper. Now, no simulation is ever going to actually provide the anxiety of a real life gun battle but it at least gets you moving and using more of your brain to complete the scenarios. I knew that I needed to be there by 8:00 AM to be able to attend a newcomer briefing, which I did. However, there were a lot of people who showed up to participate which took a long time to get them all signed in. Sixty six participants showed up which is the most they’ve had in several months. 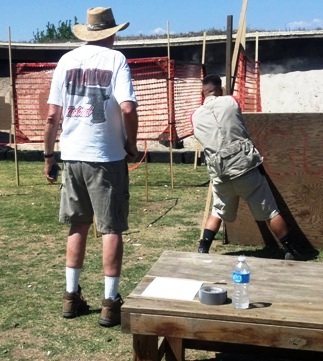 In addition, there were 16 new shooters all wanting to try an IDPA match for themselves. So as registration went long, so did the newcomer briefing. At the briefing we were schooled on safety rules, protocol, safety rules, scoring, safety rules, garments (you are supposed to be dressed for concealed cover), safety rules, advice on how to approach the match as a new never been tested first time shooter, and more safety rules. Your gun never leaves its holster except and unless directed by a “Safety Officer” (SO) to do so, or at the safe handling zone. Your finger must never be on the trigger except when aimed and ready to fire at a threat (target), especially when moving to the next firing position. Your gun must be unloaded at completion of each stage in the presence of the SO who must see the magazine ejected, see an empty chamber and witness the trigger pulled at which time he will declare the range ‘safe’ and instruct you to return the gun to your holster. Never drop your gun. It will result in a disqualification. Never shoot at the ground, accidently or otherwise, within 6 feet of yourself or anyone else (disqualification). The gun muzzle must not break the 180 degree rule. Needless to say, they take safety very seriously, as they should. They want everyone to be able to walk out of there. You are all playing with a potentially dangerous and lethal tool. But after all of that, they want everyone to have fun with it – which I think is impossible not to do. I mean, you’re going to have fun. I don’t know how you can help it. So, off we went to our respective groups for the match which had already begun. There are 8 stages grouped in 4 locations with 2 each. Each group of about 15-20 people went to one of the four bays where there are 2 stages. As each group of two stages is completed, you move as a group to the next bay of two stages until everyone has completed all eight stages. On this day, that took us over 6 hours. They tell me that normally they are about 4-5 hours. 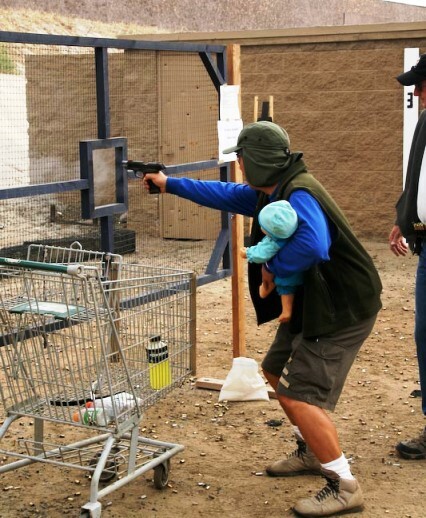 Now, normally I am a very good shot at a regular range or out at one of our fun shoots with the Big Thunder Gun Club in the desert, but this is a new dynamic. You have a lot of things to think about and you have to move too. Most of the stages required you to move either from one firing location to another or to move while shooting. On my first stage, I think I completely missed two of the targets or at least scored a “failed to neutralize” (FTN). Hey, it was my first time. My second and third stages were a little better but not much. However, by the time I got to my fourth stage, I had calmed down and was scoring much better as I took my time to aim, and some of the basics started to set in and become more natural. The stages are set up with simulated walls as “hard cover”, sometimes with windows or doors, sometimes barrels as “hard cover” and cardboard targets, which are in a rough human silhouette, that represent a threat that must be taken out. However, some of the cardboard silhouettes represent an innocent bystander or hostage, and of course, you’re not supposed to shoot those. I’ve got to say though, some of the hostages had a bad day, although not by me. I think I only shot one in the head on my first stage. Scoring is fairly simple. You are timed on each stage. The SO asks for you to acknowledge when you are ready, says “stand by” and a buzzer goes off giving you the signal to go. You draw you gun from concealment and proceed to attack the course and the threats. After two shooters have gone and the range is declared “safe” by the SO, we all move up to the target area where the scores are read and the holes taped up for the next shooter. The scoring is minus zero (-0) for a center of mass shot or head shot, minus one (-1) for the next ring, and minus three (-3) for the outer most ring. If all shots land in the minus three zone you receive a “failure to neutralize” (FTN) which is a minus five (-5) added to your minus threes. Any “procedural” violations such as not remaining behind cover will give you a minus five (-5). Each of these numbers represents a half second that is added to your time. They add them all up, multiply them by 0.5, and add that many seconds to your score. Simple, right? Well don’t worry. They do all of the scoring. All you have to do is shoot and help tape the holes in the targets. Most of the stages require about 15 – 18 shots to complete and one took a minimum of 22 which required three magazines. We live in a land of ten round magazines so that is the most you can have in any magazine whether it holds more or not. Most of the threat targets are static but there are some moving targets thrown in as well. They tell you how many shots you are to put in each of the threats. It could two or three, or even two to the body and one to the head. 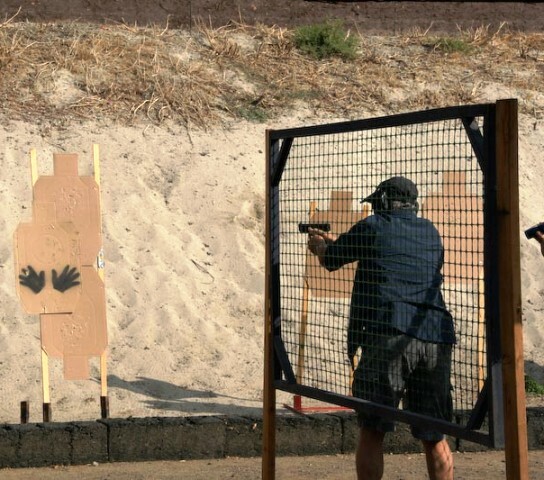 You may have to shoot each threat with two or three consecutive shots or in “tactical sequence” which would mean that you would give each of say, three targets one shot, and then follow with a second shot to each. 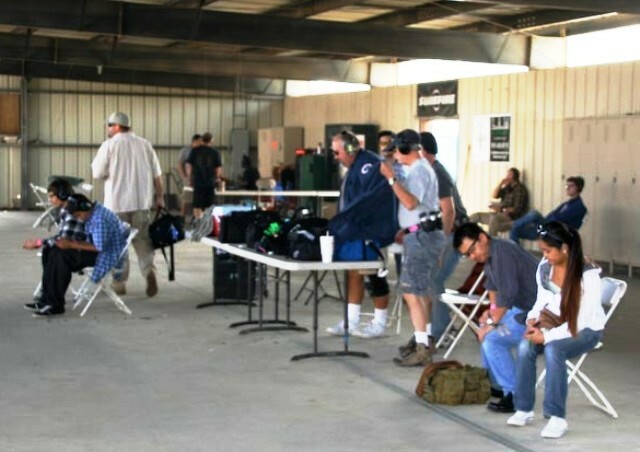 I found it comforting in that the Safety Officers and seasoned veterans are all very friendly and helpful in that they want you to have a good time and learn from the experience. Several times the SO we had in our group coached me on some things I might want to work on or pointers on how to better do something. They of course, knew that I was a first timer since they give all the newbies a name tag which tells everyone that it is indeed your first time. There was never any condemnation, only encouragement, guidance and a sharing of wisdom that has come from experience. In as much as this was my first time, I don’t expect I had a very good score, as I was walking through most of the stages just to get the hang of it, (in fact they advise that for newbies). Although, I did pick up the pace a little near the end as I got more familiar with the concept. I did notice some of the other newbies having a much more difficult time with it than I, so I doubt I will be in last place. But more than anything, I was competing against myself – trying to see how I would do with something new. I’m sure I’ll get better the more I do it. So I think I would give myself a passing grade. What’s more, I had a lot of fun doing it. Can’t wait until next time. My impressions were all positive. If you are interested in developing your tactical skills I believe you really should try this. 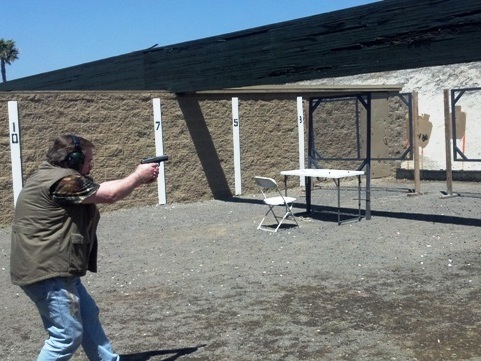 It is an excellent way to provide you with some practical training that goes beyond simply standing and shooting. 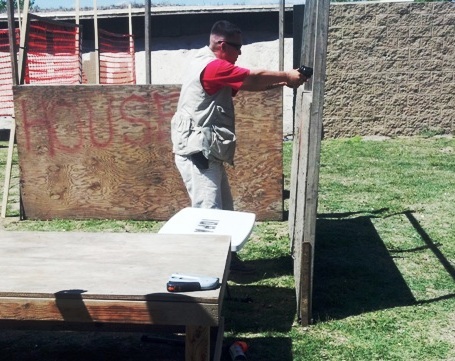 The course scenarios at IDPA matches are designed to simulate potentially life threatening encounters and test the skills that would be required to survive such encounters. In addition, you end up meeting some great people all the while you’re having a great time. If you think you might be interested in trying an IDPA match, I invite you to visit their website by clicking here. Once there, click on “Club Info” and “Club Listings” in the left sidebar and find the range closest to you. Then go have a blast.